For many migrant farmworkers, things haven’t changed much since the 1970s when the legendary activist Cesar Chavez co-founded, with Dolores Huerta, the union known today as the United Farm Workers. Today in North Carolina and surrounding states, the people working one of the most dangerous jobs in America live in squalor. They enjoy few of the legal protections everyone else takes for granted, such as the right to overtime pay. They are paid the minimum wage of $7.25 per hour, but only if the contractista or nickelero or other middleman between grower and worker doesn’t take a cut. Why didn’t the Chavez-era changes help these farmworkers? Because California, where most UFW members live and work, is a very different place from North Carolina. As a right-to-work state unions are not welcome here. But that’s not stopping Baldemar Velasquez. Like Cesar Chavez, the 67-year-old Velasquez knows first-hand what it’s like to be a farmworker. He started at age 6. “The alternative was not eating,” Velasquez tells me, going on to describe a “conversion experience” in which he realized that his loss of childhood, and personal experience of abuse, called him to become the tireless spokesperson he is today. He does a good job at it. 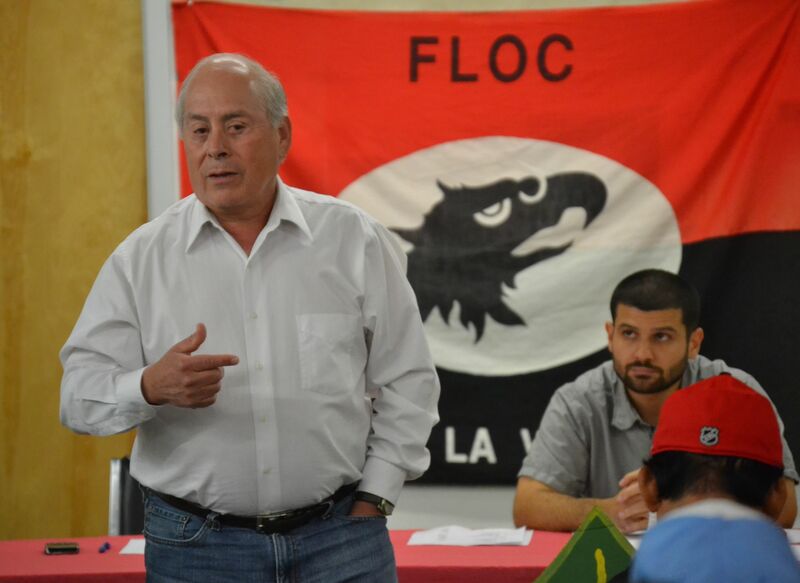 A 1989 recipient of a MacArthur genius grant, Velasquez is the co-founder with his father of the Farm Labor Organizing Committee, or FLOC. Based in Toledo Ohio, this little-known union succeeded, after years of activism, strikes, and boycotting, in bringing unionization to workers for Campbell’s, Heinz, and other major buyers of agricultural products. In the late 1990s FLOC expanded to North Carolina. After a five-year boycott of the Mount Olive Pickle Company (“Don’t spend a nickel on a Mount Olive Pickle”) they signed a contract with the company and the North Carolina Growers Association, bringing union protections to some 7,000 workers in the Tarheel state. But these represent but a small percent of all farmworkers in the region. Earlier this year FLOC launched a campaign to sign up 5,000 new members during the 2014 harvest season. Six nights a week teams of organizers borrowed mostly from affiliated labor organizations fan out to camps—mostly run-down trailer homes and dilapidated houses—to educate workers about the benefits of joining the union. As of a few weeks ago they had signed up just under 1,000. The union’s biggest obstacle? Worker fear. 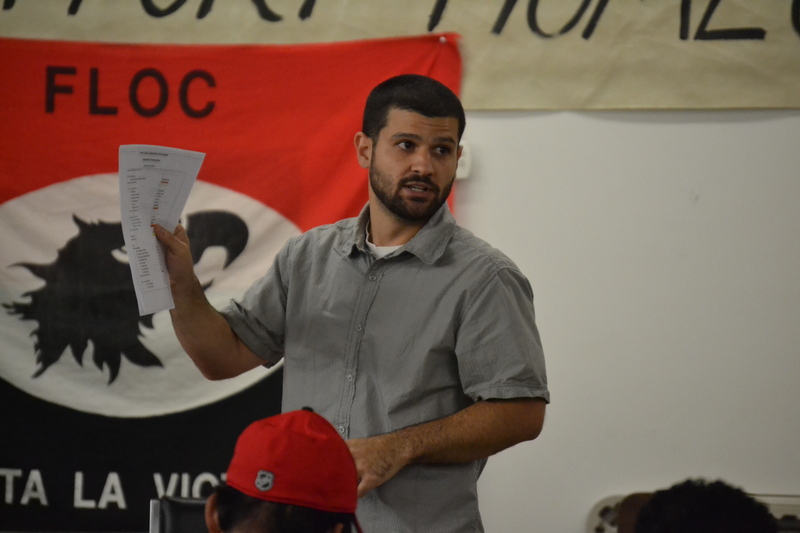 FLOC Vice President Justin Flores speaks to union members at a meeting in Dudley, NC. According to FLOC Vice President Justin Flores, the first thing most workers ask when visited by an organizer is how FLOC can ensure they won’t be fired for joining the union. 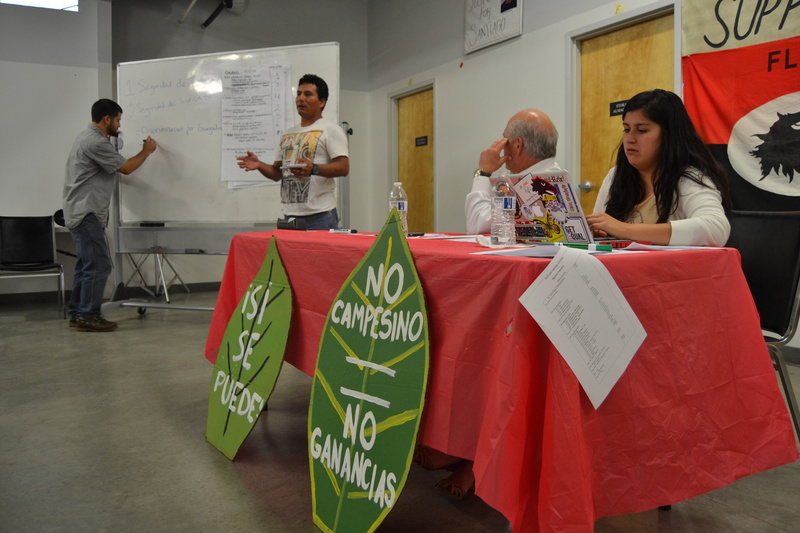 According to numerous FLOC officials, farmworkers are under constant threat of retaliation if they should speak out about working conditions, squalor in the camp, or wage theft. Flores can rattle off a long list of examples they’ve heard about: Firing. Deportation. The worst? Contractors who remind the workers they know where their wives and children live back in back in Mexico or Guatemala, then suggesting or outright vowing to make their families suffer should the farmworker not do as he’s told. This summer’s campaign has not been easy. In addition to farmworkers stifled by fear, their employers have not exactly rolled out the welcome mat. I wrote earlier about organizer Raul Jimenez handcuffed by a sheriff. Another team of organizers was briefly detained against their will, unable to leave the grower’s property until cell phone calls to the police made the threat-mongering detainers come to their senses. And FLOC’s Oscar Sanchez took a punch to his face from a representative of the North Carolina Grower’s Association—you can watch it on YouTube. FLOC has singled out the R.J. Reynolds Tobacco Company for accountability, portraying them as partly responsible for the status quo. The company is one of the largest buyer of North Carolina tobacco and could use its influence among growers, FLOC believes, to bring about change. Velasquez wants Reynolds to recognize the union, to engage the third-party Dunlop Commission (as FLOC did in Ohio) to establish rules such as how workers can raise concerns without fear of retaliation, and to provide incentives to its growers to sign contracts with the union. Baldemar Velasquez is ready to bring his plea to American consumers, and not just tobacco users. FLOC is considering boycotts of major outlets of Reynolds tobacco products: Convenience stores Kangaroo, WaWa and 7 Eleven. If the boycott proceeds, customers of those chains will be asked to buy their gasoline and Slurpees somewhere else. A spokesperson for R.J. Reynolds declined to comment for this story beyond what is on their website. There, the company emphasizes that it does not employ farm workers or grow its own tobacco. It describes efforts “to ensure that our suppliers have the training and resources they need to do the right thing for the people who play an important role in our supply chain.” These include efforts to assess conditions of its farmworkers and educate its growers. Velasquez shrugs off these efforts as “diversionary” and missing the point. Farmworkers need a voice, he reiterates. American history may be on the side of Baldemar Velasquez, FLOC and North Carolina farmworkers. The Chavez lettuce and grape boycotts of the 1970s brought changes to the Western farmworker few could have imagined. FLOC itself can point to success in Ohio. And the 2001 boycott of Taco Bell by the Coalition of Immokalee Workers forced their parent company to sign on to the famously successful Fair Food Program, in which tomato buyers vow to pay “a penny a pound” more for tomatoes to benefit pickers in Florida. Even Walmart signed on, earlier this year. With income inequality at record levels and growing media coverage of the plight of the American farmworker, the time may be right for Baldemar Velasquez to call for those boycotts to force a change. It’s worked before and may soon work again.